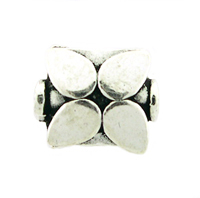 Sterling Silver Bali-Style bead measures approximately 8.5mm x 9.75mm x 5mm and approximate weight for 10 beads is 13 grams. Sold in packs of 10. Below wholesale prices.